Our BBQ Cleaning & Oven Range cleaning methods are unparalleled and have been used across the world for 20+ years. Whether your at the Beach or in Orange County, we come to you and do all the dirty work you don't want to. Get your BBQ Cleaning Instant Quote Now! We'll send you all the details right now! Our BBQ Grill Cleaning Process and Service. Making OC’s Grill Grates Great Again! 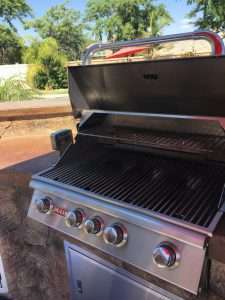 Orange County, CA Internet Users are searching for a “BBQ grill cleaning service near me”. In order for your grill to get cleaned, The OC Grill Cleaner starts with the best in the business! 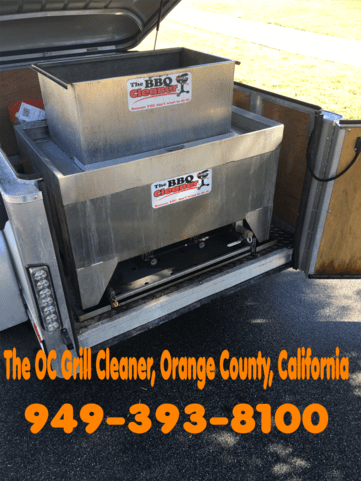 The first thing to point out is that the entire range of cleaning products used by The OC Grill Cleaner is not available to any other BBQ Cleaning Service not in the The BBQ Cleaner Network. It’s a true eco-friendly, non-caustic degreasing solution – not available to the public, we import it from Berkshire, England. The water based solution is heated into a steam bath in our mobile stainless steel dip tank that allows us to soak your dirty BBQ grill parts onsite and remove baked on grease and grime. These cleaned BBQ parts can then be rinsed and reinstalled back into your grill looking nice and clean and ready for another season of grilling. While dirty BBQ parts are soaking, we are busy inspecting, scrubbing and vacuuming out your grill so the firebox is nice and clean for the rest of the cleaned grill parts to be reinstalled. Once the interior BBQ cleaning is completed, we use a polishing cleaner for the exterior of the grill that brings back a beautiful shine to your BBQ grill. Barbecue grill cleaning is a laborious process, there are no shortcuts, but our BBQ Cleaning method is the best of all of them out there today. We are a professional grill cleaning service. Your family will thank you as well, according to WebMD (and we agree), having a clean grill is so much better for your health. Once we arrive for your appointment, we will evaluate your BBQ, probably get to know your dog or kids, and check your grill for gas leaks or any other hidden non-functioning parts. We’ll perform a functional test to ensure the grill is in good working order. If not, we’ll make notes for you on what it will take to get it back to the way you bought it. We use tarps on the ground to ensure we don’t make a mess and ensure the area is all clean when we leave. Of course, the main focus is your grill and you can expect that to be as clean as you have seen it in a long time and ready for you to get back to grilling. Never Clean your BBQ Grill this way! Power-washing. This method just pushes the grease and grime onto your property, pool and areas you don’t want it. It’s ineffective in the long run. Remove your BBQ from your property. We are equipped to clean your grill at your home, we do not remove your grill from your home and take it somewhere else to clean it for up to who knows how many days inconveniencing you with arrivals and departures. Power grinders. This can scratch your grill, and wears down the metal inside your grill and is not effective in the long run as well. We are working with many people who want a BBQ cleaning service, try us! Avoid this outcome with our BBQ Cleaning Services. Send Us Your BBQ Cleaning & Repair Questions.